Local governments and tribal nations have an opportunity to save money and create jobs by joining the growing renewable energy economy, according to a new publication from the University of Wisconsin-Extension. 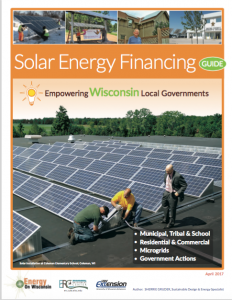 Solar Energy Financing Guide: Empowering Wisconsin Local Governments covers financing for solar projects ranging from local and tribal governments installing solar systems on their own roofs and land, to assisting local businesses and residents with acquiring solar. It includes case studies of successful solar energy systems across the state, and outlines creative local government actions, strategies and partnerships that can lay the groundwork for financing those systems. Sherrie Gruder, Sustainable Design & Energy specialist with the Environmental Resources Center of UW-Extension and author of the new guide, notes that there are a number of reasons why advancing solar energy can be a good move for local governments. “Solar energy supports lower electricity bills, greater energy independence and resilience by reducing dependence on imported fossil fuels, and job growth by providing new, good-paying jobs and training for workforce development,” says Gruder. Gruder will speak on “Solutions for Financing Local Government Solar Projects” at the 28th Annual Energy Fair in Custer, Wisconsin on June 16. The fair annually attracts more than 13,000 people interested in learning more about clean energy and sustainability. More information about the event is available here. Solar energy is more widely affordable now as a result of dramatically falling prices of solar equipment, as well as innovative financing approaches and partnerships. UW-Extension research has uncovered multiple paths and sources used by Wisconsin municipalities, tribes and school districts to finance solar development that reduces costs and enables residents and businesses to invest in solar. Gruder says that Wisconsin relies on imported coal for approximately 63 percent of its electricity and sends $12–$15 billion out of state each year for fossil fuel energy. “By increasing solar as a local electricity resource, Wisconsin will keep more money at home where it can circulate in our local economy and provide local jobs,” she says. Mark Renz, UW-Extension Weed Specialist, talks about a new guide to toxic plants. 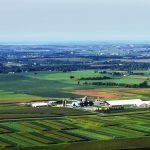 Visitors to Wisconsin Farm Technology Days can connect with University of Wisconsin-Extension specialists and agents about the latest research they are conducting as it relates to dairy, farm business, and water. Specialist Central, located in the UW-Extension Education Station will feature interactive discussions with UW-Extension specialists, each day focusing on a specific topic.